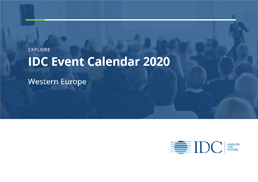 Branded "in association with IDC", IDC provides an end-to-end managed event service incorporating everything from content definition and creation right through to event promotion, delegate acquisition, event execution on the day and overall project management. These invitation-only events provide you with invaluable face time in front of C-Level, senior technologists, and business decision makers responsible for evaluating and purchasing technology solutions and products. Our goal is to create exceptional thought leadership events, delivering valuable experiences that are ideal for building dynamic — and profitable — business relationships.